This scene, the Adoration of the Magi, may be found depicted in stained glass in the great east window of St George’s Chapel. Designed and installed by Clayton and Bell in 1862-1863, the window was intended as a lasting memorial to Prince Albert, whose death at Windsor in December 1861 had shocked the nation. The window was commissioned by the Dean and Canons in memory of the Prince Consort, who had taken a great deal of interest in the Chapel, with the lower tier of the stained glass depicting scenes from his life and good works. The Adoration of the Magi was one of three central scenes featuring Christ, the other two being the Resurrection and Christ seated in glory surrounded by angels and seraphim. The panes to the far left and right depicted a selection of prophets, elders and saints. 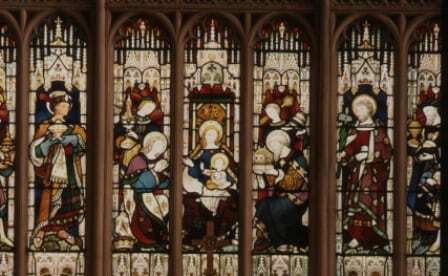 The scheme was devised by one of the Canons, Canon Courtenay, whose letters and detailed description of the completed window, now held in the St George’s Chapel Archives and Chapter Library, explain his choice of subjects and the iconography. Canon Courtenay originally planned to include Christ’s Transfiguration in the second tier but Clayton and Bell ‘found the Transfiguration impossible & have adopted the Resurrection, which I like better’. In addition to their wish to honour the Prince, the Dean and Canons used this as an opportunity to rid themselves of Benjamin West’s unfashionable eighteenth century painted glass window, described in a Chapter memorandum as ‘the acknowledged eye-sore in England’s most beautiful Gothic Chapel’, and to make use of the considerable sum which had accumulated in the Window and Altar Fund mainly from fees paid on installation by the Knights of the Garter. The decision to employ Clayton and Bell to design and install the stained glass window probably lay with consultant architect George Gilbert Scott, who was supervising the project. He had worked with them elsewhere, including at Westminster Abbey, and was impressed with their skill. The choice was no doubt endorsed by Canon Courtenay, who had commissioned Clayton to design the east window of his church in Bovey Tracey. Prior to the installation of the glass, Scott had to arrange for the reinstatement of the stone mullions which had been removed when Benjamin West’s window had been installed. Once the window had been completed Scott turned his attention to the carved angel frieze which framed the east window. The lower sections of this frieze had been removed in order to accommodate the eighteenth century window, although the late medieval carving at the top had been left in place. In 1868 Chapter ‘determined to continue the figures of Angels down either side of the East Window from the points where they cease’, with Messrs Poole & Son undertaking the work from Scott’s designs. The whole of the angel frieze was then decorated and gilded by Clayton and Bell. Queen Victoria was very pleased with the memorial window, describing it as ‘really magnificent’ and it formed a fitting back-drop for the marriage of Albert Edward, Prince of Wales, which took place in St George’s Chapel in March 1863.